For years, the American kitchen has been the hub of the home. Over the past years, homeowners have looked for ways to enlarge that circle into their yards and gardens. Once an exclusively high-end luxury, outdoor kitchens are now one of the most popular upgrades for mainstream neighborhoods. An outdoor kitchen is viewed as an experience, while the indoor kitchen is viewed more as a room for work. However, both areas are vulnerable to fire damage. According to Home Advisor, the national average cost of building an outdoor kitchen is $10,670, with the high-end reaching $50,000. So it makes sense to plan some safety features into your design. Working with an experienced designer and builder helps to ensure your island is built for safety: with the right ventilation, insulation, design, and materials. If the barbecue area is completely enclosed, smoke could get trapped by the roof. You’ll want to install some type of ventilation system or chimney to allow the smoke to vent up naturally. Use directional fans attached to walls or ceiling to help direct smoke out of the structure. If you’re building a covered grill, install a hood. 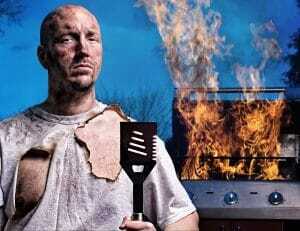 Without a hood, all that grime produced from grilling can build up a fire hazard along the wall. Plus the constant heat can damage or ruin the siding of your home or patio. So plan adequate ventilation to ensure that cooking smoke and fumes are quickly removed. Set your grill up a safe distance away from structures and overhangs; your main home, outbuildings, sheds, garages, trees and other potentially flammable objects. Cords of wood stored against the wall of your dwelling waiting for the fire pit or oven will damage your house if logs begin burning. Finally, install a hand-held fire extinguisher permanently located near the cooking area is a super idea. For safety, keep your fire small; the bigger the fire, the greater the potential for disaster. The fire pit should be at least 10 feet away from any structure or combustible surface. Avoid windy conditions that can blow embers. Also, stay up to date on any burn bans or burn ordinances that might be in effect. Plan the outdoor faucet and a garden hose nearby. Cooked on a classic charcoal grill, a simple hamburger becomes a legendary family meal. This popular way of cooking is fun, but it also poses unique fire risks of its own. Only use starter fluid specifically designed for charcoal. Apply it to cold coals only, and don’t add extra fluid once the grill is lit. Store extra charcoal in a secure place away from other potential fire hazards, and preferably in an airtight metal container. Empty your used ashes only when they have fully cooled. Never store or dispose of them in a garbage can or leave them on a deck; use a metal receptacle for proper disposal. Gas grills are convenient and easy to use and require less refueling than charcoal grills. But gas grills are also more susceptible to fire risks, so practice safe grilling. Check the gas line and tank fittings regularly for leaks. Brush soapy water around these areas; a leak will cause bubbles. Store spare gas cylinders upright away from any structures to minimize fire risks; never store them under a stairway or the eaves of your home. Among outdoor kitchen owners who had already built their space, many regretted not including some features– at the top of the list was a built-in pizza oven. Serious BBQ fans can install. Light your outdoor appliances (without electric starters) with special long-length lighters or long matches to avoid getting burned. Clean thoroughly and often to reduce flammable buildup inside. 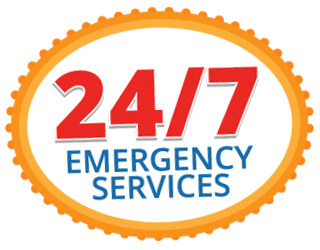 In the unlucky event that you have a fire in your outdoor kitchen, or anywhere in your Concord home, All Brite Cleaning & Restoration, Inc. provides cutting edge technology and outstanding service experience. Every job comes with a 100% risk-free guarantee. If you are not happy with the work, they will come back and redo it for free. And if a spot reappears, call within 30 days and they’ll come back and fix it – no hassle and no charge. Still not satisfied? They will refund your money.